0 Comments Published by KL Ocs Kid on Monday, July 16, 2007 at 9:44 AM. 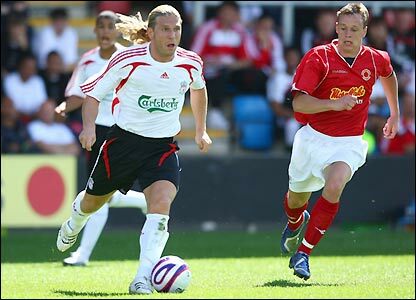 Ukranian forward Andriy Voronin impressed on his Liverpool debut in Saturday’s pre-season friendly win over Crewe. Goals from Lee Peltier, Peter Crouch and Ray Putterill gave the Reds a 3-0 win as Rafa Benitez again used two teams as his side prepare for the new season. Voronin started alongside Peter Crouch and was lively in the opening 45 minutes, he created the opening goal for Peltier after the new signing’s shot was parried out to Peltier who finished well. He showed good skill but also hard work and looks like he will battle for a first team place this season. Putterill and Jay Spearing in particular impressed. Crouch took his goal well and Pennant again showed good form. The squad head off to their training camp in Switzerland on Sunday, along with new boys Fernando Torres, Ryan Babel and Yossi Benayoun. Torres is expected to make his debut against Werder Bremen on Tuesday, while Benayoun and Babel could make appearances against Auxerre on Friday. After the matches in Switzerland the team travel to China for the Barclay’s Tournament.